Seefar and Metoo lived a long, long time ago, before there were as many toys as we have today. But Seefar and Metoo still had lots of fun playing with toys they made on their own. One thing they didn’t have at all, though, was English words! Seefar and Metoo didn’t know all the different words you do today. 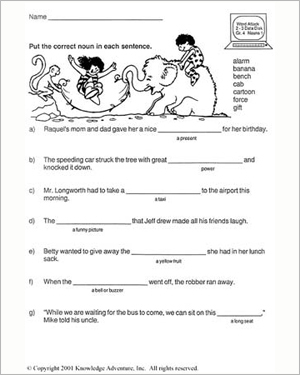 Can you show them how to use the nouns in this worksheet by putting them in the right places? You can use the word meanings of the nouns for help if you need it. This English vocabulary worksheet helps 3rd graders learn the word meanings and word usage of simple everyday nouns.